Assorted GARbage» Blog Archive » Congratulations, Adobe TV Team! Along with everything else that is going on on the ninth day of the ninth month of the ninth year of this millennium, my colleagues on the Adobe TV team have launched their completely redesigned site. 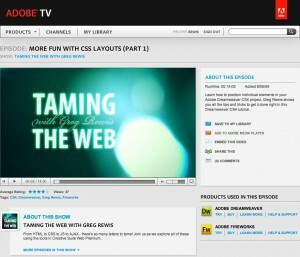 The initial version of Adobe TV was launched about 18 months ago. And while it accomplished its mission to provide a single point on the web for learning about Adobe products, it was quite honestly a mess due to a hastily thrown-together backend and an even worse user experience. Ironically, I’m almost sad to see the old site go, as I used to use it as an example of what NOT to do on the web – namely build an entire site in Flash/Flex. Don’t get me wrong, I love Flash and have no problem with Flash content – especially video. There are only very limited examples of using Flash/Flex to build an entire public facing site and doing it right – so limited in fact that I can’t even think of any. The team has not only made it easy to search (and actually find) content. They’ve implemented working ratings systems, added the ability to easily share videos on social networks and provided end-users with the ability to completely customize the content that they see on the front page of the site. All around, this is an amazing redesign. So, congratulations to the entire Adobe TV team on a job well done! And while I’m at it, how about a gratuitous plug… Be sure to check out my series, Taming the Web – we’re about half way through this season’s 18 episodes. New shows are released every two weeks. Click on the Subscribe link on the show’s main page to automatically be notified when new shows arrive. Excellent Site, now I got a RSS feed to alert me when a new episode of taming the web is available! Totally, the previous design and user interface really sucked. I am just wondering why they did it the wrong way in the first place. @maque – Well, unfortunately, the team had a very limited budget and even more limited physical resources. The one developer that they had is/was a Flex developer, and therefore, the decision to go with a completely Flex-based site was an easy one. As we (and they) now know, it is not the best solution for a high traffic, globally oriented site like Adobe TV. I am a Flash Dev and I am offended. I loved the old site !! i like the rating system as it gives both Adobe, the content producer and the viewer a real sense of what was useful, instructive and valuable. I suspect there will be alot of 4 to 5 star ratings as the material here is often better than anywhere else. The new Adobe TV may be great but I just cannot get it to run all the old systems worked? Hello i wonder when the release of the publishing technology used to build the WIRED Reader is coming ? Is there any date set yet ?